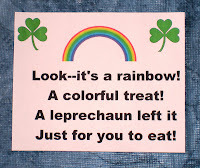 I found this cute little treat for "leprechauns" to leave the children on St. Patrick's Day. I found this in my folder, I think it may be from a later version of "The Mailbox" magazine, but I only had the page copied. It was contributed by Sarah Booth of South Williamsport, PA. Put one of each color of the Skittles into a zipper bag. Then slip in the poem and close the bag. Try to surprise the children by having them in a special place for them to find some time during the day. 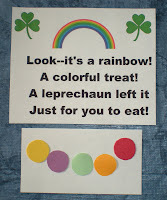 A leprechaun visits our house every year and leaves little green footprints up the side of my sink. He leaves candy for the kids at the end of his trail. I'm going to try to catch the little guy this year! I thought maybe it would be fun to build a trap, but my 4 year old doesn't think it would be very kind of us to do so. He, He. I use kissable candies (Hershey Kisses with a hard shell) instead of skittles. I found many children don't like skittles, and you can't go wrong with chocolate.